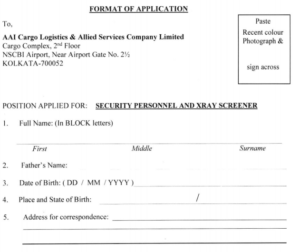 AAI Security Personnel & X-Ray Screener Recruitment 2018: 32 Vacancy Apply Online – AAI Cargo Logistics & Allied Services Company Limited (A 100% Subsidiary of Airports Authority of India) has informed that there are total 32 vacancies on a fixed term contract for a period of 3 years at NSCBI Airport, Kolkata for Security Personnel and X-Ray Screeners. Vacancies are divided unequally as 4 for Scheduled Caste Candidates, 5 for ST, six for Other Backward Class and 17 for General Category candidates. Moreover, for this job, if you have any out of Diploma/ Certification Course in Computers, Armed Forces/ Police backgrounds, Legal Knowledge, Knowledge of Unarmed Combat, Knowledge in Disaster Management, Knowledge in Industrial Security, Proficiency in Fire Fighting, NCC ‘B’/ ‘C’ Certificate etc. then a big congratulations as you will be preferred now. 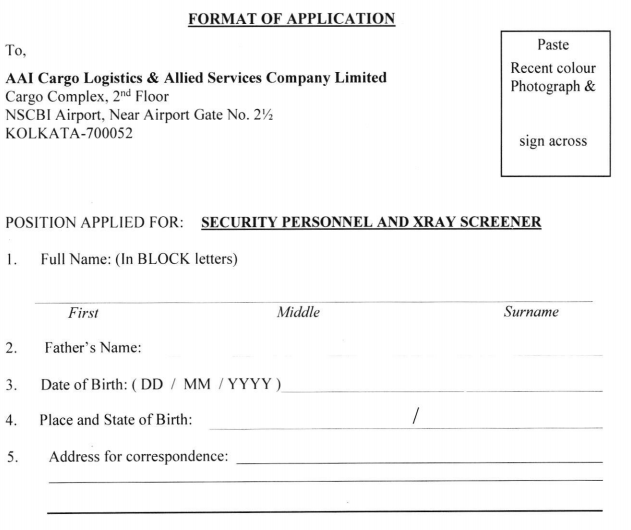 While maximum chances of selection of AAI Security Personnel & X-Ray Screener Recruitment 2018 will be of those who must be possessing valid BCAS Basic AVSEC (12 days new pattern) Certificate. Besides, ability to speak Hindi, English and conversant with local language and minimum three years duration graduation in any course from the authorised university is mandatory. Besides the fact that the candidate should not be above 45 years of age as on 1st August 2018, there will be PST (Physical Standard Test) as well. For example, male and female height required will be 170 cm & 157 cm, 165 cm & 155 cm, 162.5 cm & 150 cm respectively for General, SC/ OBC and ST, Gorkhas and those hailing from the North-East States and Hilly Areas. With offline Application, candidates need to attach Any Document in regard with point no. 20 of Application Format, Domicile Certificate, Passport Copy, Aadhar Card Copy, PAN Card Copy, Nationality/ Domicile Certificate, Experience Certificate, Discharge Certificate in case of Ex-Servicemen, Caste Certificate in case of SC/ ST/ OBC Candidates, Doctor’s Certificate (in original) for Height & Weight (As per format), NCC “A, B, C”/ Basic AVSEC/ X-bis Certificate, No Objection Certificate from present employer, if applicable, Graduation Certificate or Provisional Degree Certificate, 12th standard/ pre-degree mark-sheet and passing certificate, 10th standard/ matriculation mark sheet and passing certificate, demand draft (not applicable for SC/ ST/ Ex-Servicemen/ Female) etc. For more latest news related to AAI Security Personnel & X-Ray Screener Recruitment 2018, please visit ALLINDIAROUNDUP website.